California's strategy to cut water use by 25 percent is a work in progress. On Saturday, regulators charged with implementing Gov. Jerry Brown's sweeping mandate for statewide water savings issued a revised plan based on more than 250 comments they received, many asking for changes in the preliminary framework issued in early April. The new plan, drawn up by the State Water Resources Control Board, doubles the number of "tiers," or conservation levels that local water agencies will be required to attain in the coming year. Cities will now have thresholds ranging from 8 to 36 percent, separated by smaller increments. Officials say the new structure will "lessen the disparities" between agencies. Though the new draft reassigns some local agencies to lower conservation targets, the highest number -- 94 agencies, or nearly a quarter -- are assigned the most stringent requirement of 36 percent water savings -- for now. Only 23 agencies, including the San Francisco Public Utilities Commission, are in the most permissive 8 percent tier. Agriculture-intensive areas: The "handful" of suppliers that are classified as urban agencies but send more than 20 percent of their water to commercial agriculture can exclude the farm water portion from their savings calculations. Water-flush areas: The relatively few spots, mostly on the North Coast, that are "not experiencing shortages" can petition for assignment to the lowest tier if they demonstrate that they have a multi-year supply available. 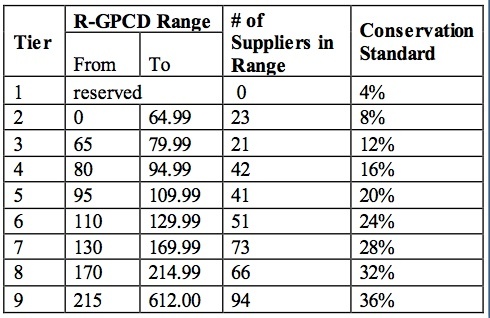 Small suppliers: Utilities with more than 15 but fewer than 3,000 connections have a separate, less exacting standard. The carrot: Cities that achieve high savings can ask to be reassigned to a special Tier 1, which carries only a 4 percent reduction threshold. No water agencies are currently in Tier 1, which is reserved for high achievers. Water board chair Felicia Marcus says the special provision for agriculture-intensive suppliers is the fair thing to do, despite the "distracting and incorrect soundbites" in recent media coverage that imply that farms are getting a free pass. Marcus has repeatedly said that the farm belt is being cut back on water, but under a different mechanism. 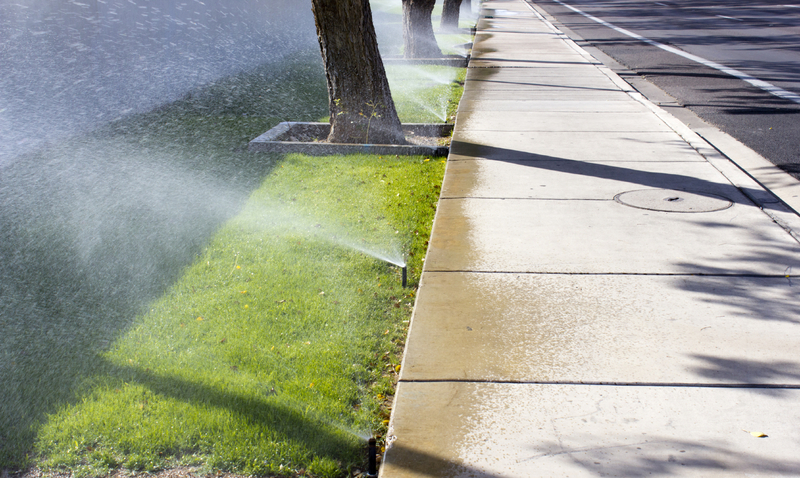 Commercial and industrial users won't be asked to cut into water use that's essential to their businesses but will be asked to "target" discretionary use such as watering of ornamental landscapes on their properties. As to how that will be managed, Marcus says, "We’re leaving that judgment to local agencies." Asked what residential water consumers or "end users" should be doing right now in response to the governor's April 1 mandates, Marcus responds: "More of the same and doubling down." Officials continue to invite comments through next Wednesday. See how your town stacks up on the complete revised list of assigned savings thresholds.